(Los Angeles, CA – February 22, 2016) After a hugely successful European and U.S. run with Slash last year, RAVENEYE are thrilled to return to the States with The Darkness this May. The tour begins on April 8th in Santa Cruz and continues down the west coast hitting San Diego, and L.A. before heading east to Las Vegas and Arizona. RAVENEYE will then continue south to Texas, New Orleans, Nashville, OH, Chicago, Indianapolis and then the east coast, finally ending on May 4th in Boston. 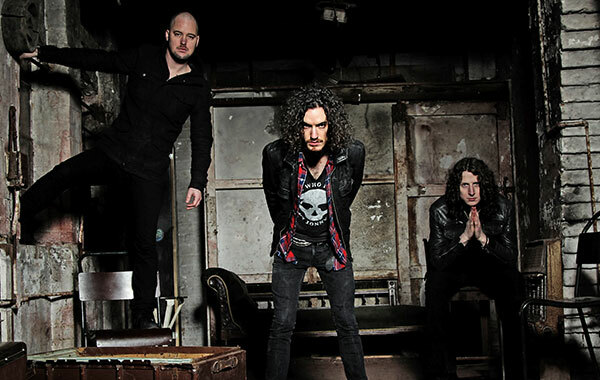 Once The Darkness tour raps, RAVENEYE will head to three of the major rock festivals of the spring with an appearance at the Monster Energy Carolina Rebellion at Charlotte Motor Speedway on May 8th. Then off to Wisconsin for the Northern Invasion on May 15th, before finishing up on May 29th at Rocklahoma in Pryor, OK. Additionally, RAVENEYE solo dates in May will be announced shortly. RAVENEYE continue to celebrate the success of their self-titled debut EP which is still riding high on the Amazon best sellers list. Late last year, the Salt Lake City Tribune said of the band, “British three-piece RavenEye sound like the illicit love-child of Wolfmother and Crobot… Singer/guitarist Oli Brown proved both a capable shredder and a captivating frontman, drawing in the audience”. Meanwhile popular gaming YouTuber, Frankieonpcin1080p has continually praised and promoted RAVENEYE in his videos to his 3 million followers. Even though he’s still only 25 years old, Oli Brown, singer and multi-award winning guitarist, has already released four solo albums and toured the world for 10 years with legends such as Jeff Beck, Buddy Guy, Johnny Winter and Joe Satriani. Mojo Magazine hailed Oli as, “the hottest young pistol in British blues’ and Classic Rock Magazine described him as “one of the best and brightest guitar heroes performing in the world today”. He has recorded the 5 tracks on “Breaking Out” late last year, before teaming up with drummer Kev Hickman and bassist Aaron Spiers and to take the songs out live – et voilà – RavenEye was born. Filled with deep, bluesy grooves which invoke giants such as Zeppelin and Soundgarden, the band (who only formed a year ago) are winning fans around the world with their huge sound and killer live shows. ”Fuzz-tacular Garage Rock” – Kerrang!